The Archaeological Museum of Poros is located in the center of Poros town (and harbour) on Koryzis Square. It was built in the 1960s on the land donated by the Koryzis family. The displays of the museum date from the Mycenaean era to Roman times. It contains a notable collection of artifacts dug by the French Archaeological School in Troezana such as collections of funerary stelae, ancient inscriptions and geometric pottery. 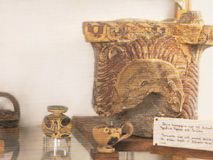 It also contains excavations of the sanctuary of Poseidon at Kalavreia, ancient inscriptions and Hellenistic figurines from Aghios Konstantinos in Methana and items such as pottery, bronze vessels and figurines from the old excavations at Hermione.